I went through my past projects and gathered my favorite Fall diy home decorating ideas to get you in the mood for Fall decorating. Are you thinking about Fall yet? I’m dreaming of Fall. This hot weather is killin’ me. Have you guys noticed the stores are full of Fall craft supplies and home décor? I actually bought a wreath last week. Probably should make one instead. I think the new one will hang on Mom’s Nursing Home door. 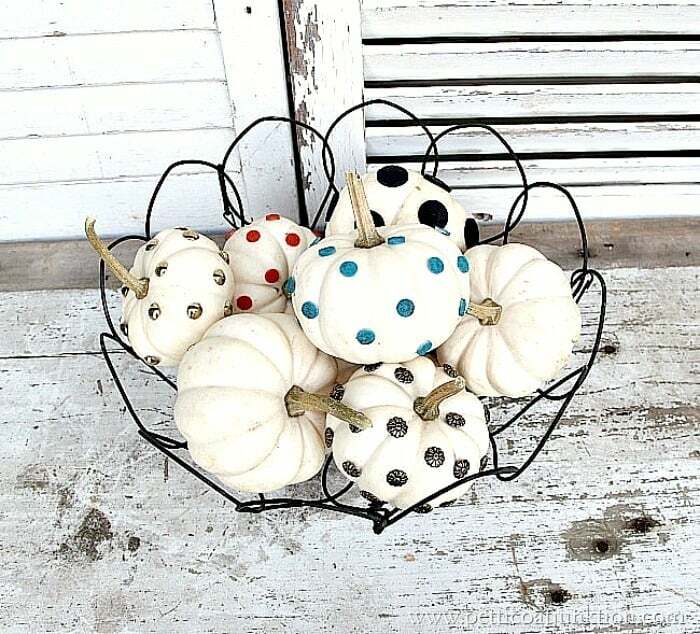 I bought it at T.J. Maxx and it’s gorgeous….velvet pumpkins and all. The price was very reasonable. I couldn’t buy the supplies and make it for any less. Time to get on with the featured Fall projects. 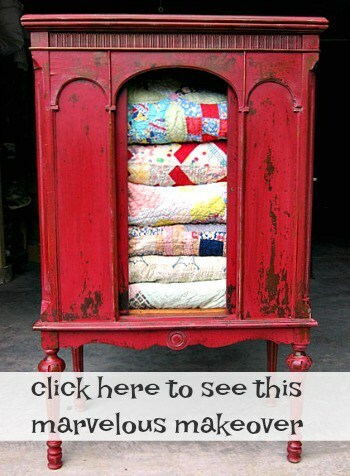 All of these are very inexpensive to make and are mostly recycle and upcycle junk projects. For those of you who aren’t junkers or have a good source for junk supplies, no worries. A few of the projects are made with new stuff you can buy in any discount store. 2. Tacky Pumpkins. I decorated the small white pumpkins in no time at all. And that included spray painting the adhesive wall protectors. Yep, that’s what I said. I used things found hanging on the pegboard in the workshop to decorate these beauties. Small white pumpkins are some of my favorites although all of the new pumpkin colors and hybrids they are coming out with are pretty cool. Let’s face it…..white works with any décor. 3. 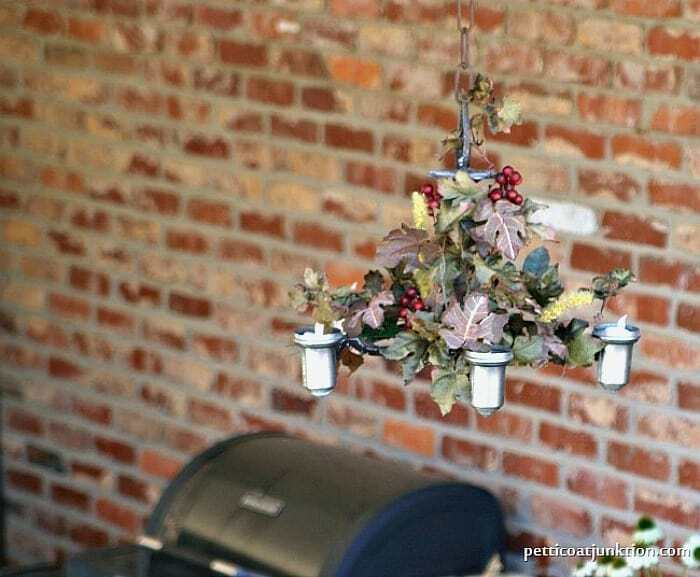 Art Deco Chandelier Repurpose. The chandelier was so cool and I didn’t know what to do with it. I made the hanging LED light and then I sold it. Wish I still had it. I have to get rid of stuff or my house would for sure be overrun with junk. 4. Pumpkin Box and Tic Tac Toe Table. 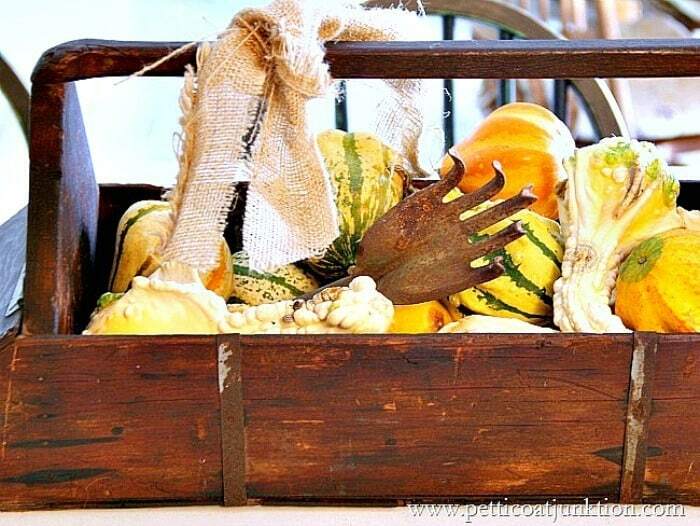 The tray of pumpkins with the garden tool looking like a hand is easy to put together. So is the Tic-Tac-Toe table included in this post. You need to click to see it and all of my Fall Home Tour from 2014. 5. 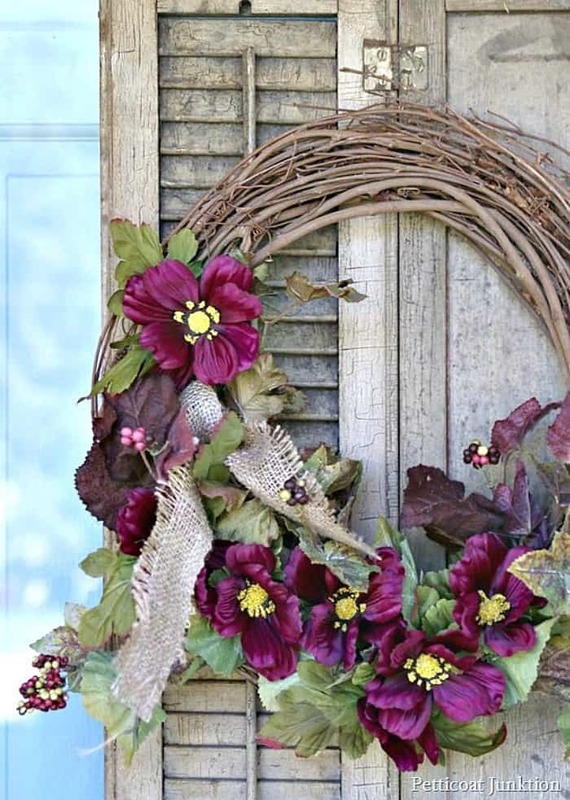 Vintage Shutter Wreath. 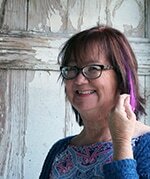 I made the wreath with purple flowers but it looked so small hanging on the front door. What to do about that. Hang it on antique shutters then hang it all on the front door. Perfect. 6. 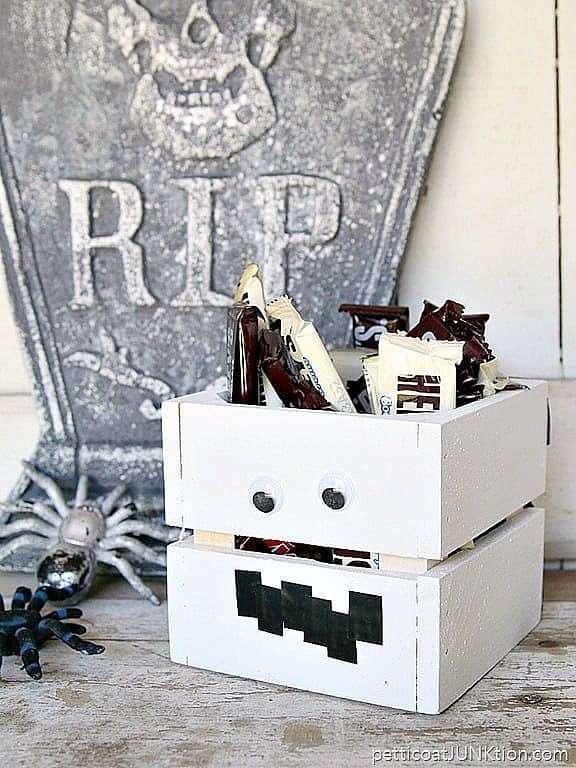 Mummy And Jack-O-Lantern Mini Treat Crates. I guess you can tell this project was pretty easy. I painted a mini crate white and used googly eyes and electrical tape to decorate them for Fall. 7. 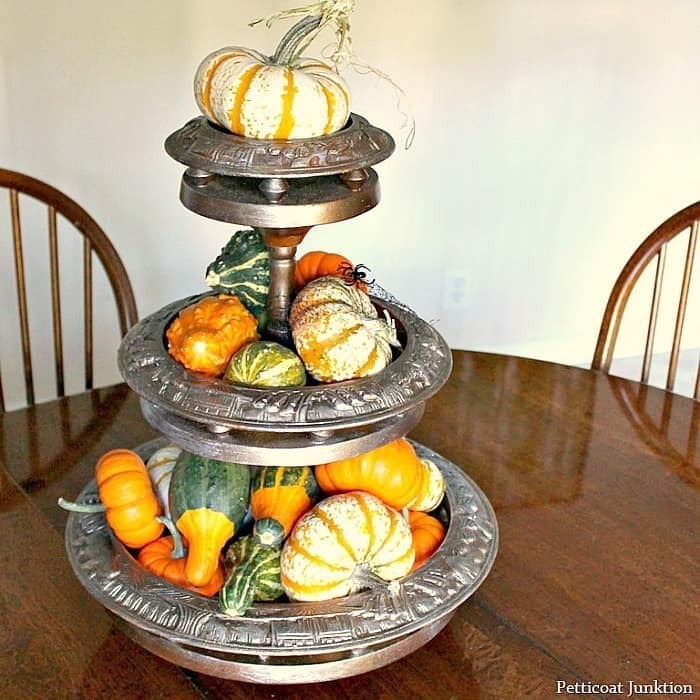 Metallic Pumpkin Carousel Centerpiece. When I bought the wood centerpiece at the junk shop it was in pieces. It took me a while to figure out how to get it together. Metallic spray paint is responsible for this pretty look. 8. Fall Mantel Wreath. This grapevine wreath is really large and I only added a few flowers. Asymmetrical all the way. 9. How To Decorate The Mantel For Fall. Do you know how to decorate your fireplace mantel? Over the years I’ve learned a few tips and tricks and I share them in this Fall mantel decorating post. 10. Wood Block Pumpkins. The wood corbels were a yard sale find and they sure make cute pumpkins. 11. Fall Wreath Rake And Birdhouse Planter. I saw a rake wreath on Pinterest a number of years ago and always loved it. 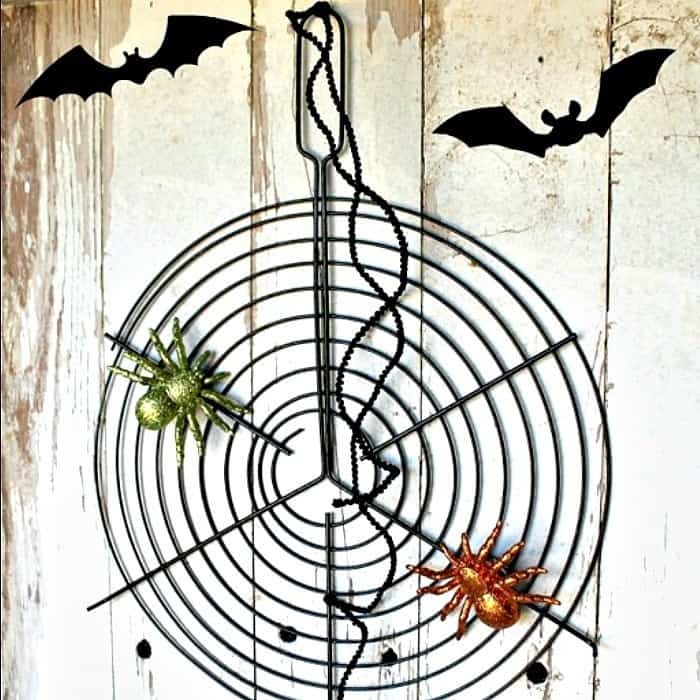 I found the perfect rake and the perfect wreath……just put them together. ta-da! 12. Fun Candy Containers. The kids loved the decorated glass jars. Googly eyes get me every time too. I can’t help but smile. 13. Spray Painted champagne Pumpkin. The champagne color spray paint is a soft gold. I painted a pumpkin after taping off an area with painter’s tape. 14. Eclipse Pumpkins Tribute. These are my favorite. They may be a bit far-out for some. All of last year was about the total eclipse and we were in the zone of…..I forgot what they called it now! Anyway, as a tribute I painted the pumpkins with little eclipse designs. 15. Favorite Halloween Treat. This is not a project….it’s food…sweet food. 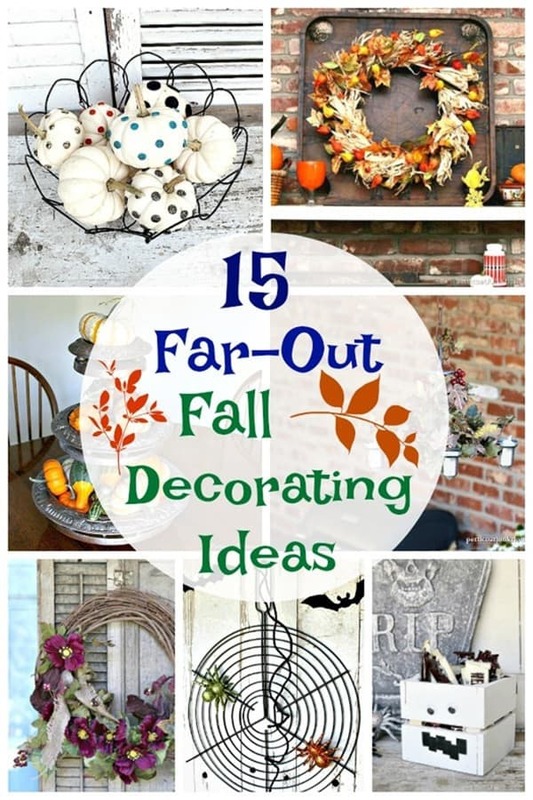 That’s it for the Fall décor ideas. I hope you found some inspiration. I wanted to think everyone for the comments on the chest from he!!. I agree with you all that I need bigger statement knobs for the black chest. I’m on the hunt. I really love all your projects and i am definitely decorating my home with Spider Web Door Wreath. It looks so cool and unique. I hope you will keep posting more unique ideas like this one. Thanks, Kathy, for all the ideas! I am sick of this hot weather, too!. But I don’t like cold weather either. Can’t we just have pleasantly warm weather for Fall? Geez! Global warming. Never know what to expect. Not like it used to be thirty or even twenty years ago, it seems to me. hahaha, semi-nakedness…..as long as no one can see me. I don’t like cold weather either but I love the cool weather of Fall.